Residents have spoken of their shock after a woman was slashed in the neck in a Sheffield suburb. A 43-year-old woman was taken to hospital following the attack on Kyle Crescent in Southey Green during the early hours of the morning. She was taken to hospital, where police said she remained today in a serious but stable condition. 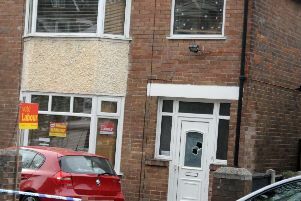 A 23-year-old woman was arrested on suspicion of attempted murder and remains in police custody. Officers were called at about 12.50am to the street, close to the junction with Kyle Close, to reports a woman had received slash wounds to her neck during an altercation outside a property. The area was cordoned off this morning as police investigated but the cordon has since been lifted. Anyone with information is asked to call police on 101, quoting incident number 47 of September 22.